Two Chinese military Ilyushin Il-76s touched down at Perth Airport on Saturday to help take part in international search efforts for missing Malaysia Airlines flight MH370 in the southern Indian Ocean. The Il-76s flew into Perth Airport from Malaysia and soon after relocated to RAAF Base Pearce. The two aircraft are due to join the search efforts on Sunday, alongside four RAAF AP-3C Orions, a RNZAF P-3K2 Orion and a US Navy P-8A Poseidon that are now involved in the search for the missing 777-200ER. A Japanense navy P-3J Orion is due to arrive in Perth on Sunday, while two civilian aircraft with AMSA trained volunteer air observers onboard joined the search effort on Saturday. 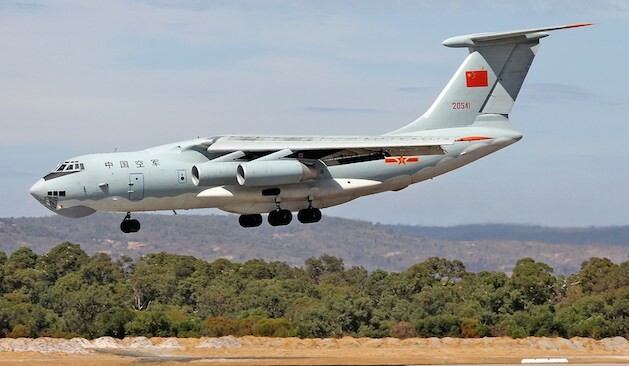 Who would ever of thought that you would see Chinese Military aircraft at a RAAF base! Why aren’t drones being used in the search ? Weren’t they supposed to land at Pearce and got PER by mistake? The Chinese landed at the wrong airport! I don’t think they were supposed to land at PER then take off again for Pearce. Why did they do that? Some kind of intelligence gathering? Maybe the crew and aircraft had to landed at perth to clear customs first before moving to Pearce since they flew in from Malaysia?? It’s better to have a manned aircraft with multiple sets of eyes looking for debris. A UAV only looks where the operator points the camera and it is easy to miss objects floating on the surface. Absolutely correct . . .the Chinese aircraft and crew are required to clear customs and immigration on initial arrival in Australia, and there is no facility for that at RAAF Pearce, it’s a pilot training base! I would have loved to hear the comms exchanges on arrival, I’m not sure how much English language experience these crews would have had prior to this! Anyway, what really old generation airplanes these are, I’m surprised they are still flying ’em . . . . have you seen one up close, I have, they’re built like a tank, literally! Please keep your comments relevant to the aircraft movements coming and going from Perth & Pearce. I have had to ‘trash’ several comments this week which were either just ridiculous or were bordering on racist and added nothing whatsoever to the story.